The gorgeous patterns and golden hues of this classic wood design can enthuse a warm and welcoming feel in any space. 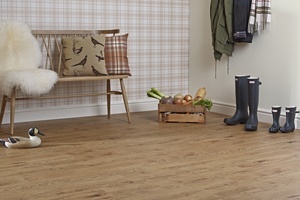 Style the floor with traditional tartan patterns, cosy creams and traditional furniture to land the country look. Striking knots, ashen tones and bevelled edges combine in this gorgeous wood design to emulate the authentic appearance of smoked oak. Accentuate the floor's character with a monochrome colour scheme and add dashes of colour for a modern twist. 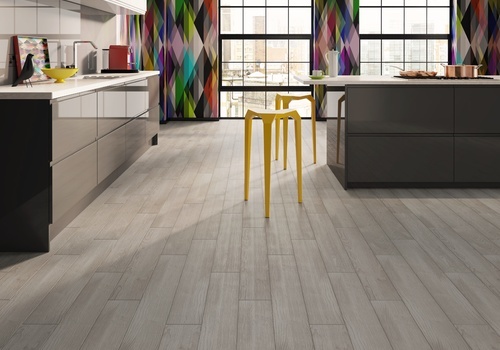 Soft grey tones are pooled with intricate grain patterns in this contemporary twist on a classic smoked floor. 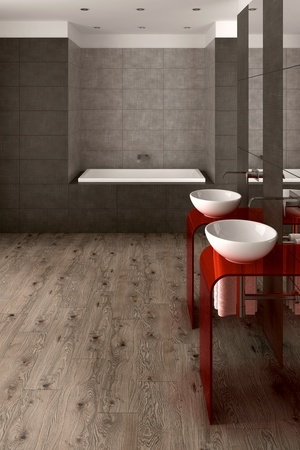 This dark grey flooring design captures all the contrasting beauty that’s found in a real smoked timber. With undulating cocoa accents, hazy grey hues and arresting rustic details, the result is classic with a contemporary edge. 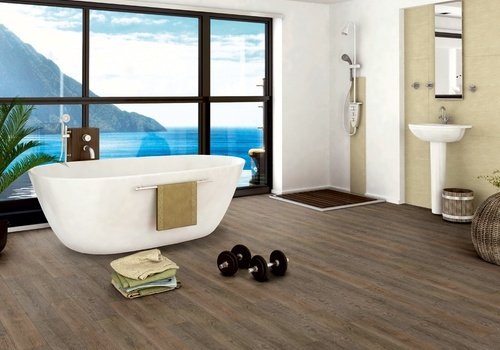 The great thing about Smoked Oak is its built-in Vitesse magnetic technology, meaning the floor can be fitted completely adhesive-free to a magnetic underlay in a quick and easy installation. 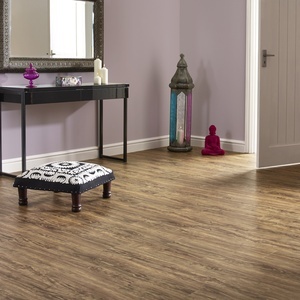 Get a closer look at the interesting colours of this vinyl flooring design by ordering a free sample. You can also view larger swatches and discuss your flooring ideas with an expert by popping in to your nearest retailer. Find a stockist here. Blur the lines between outdoors and indoors with this striking rustic design that exudes earthy tones and natural character. Fresh greens, bright white and wicker accessories complement the wood to capture a sense of tropical zest while glossy fittings add a modern twist. Oozing with flowing grain character and rich caramel hues, this warm design is luxuriously unique. Style the floor with dusky wall colours, ethnic patterns and eclectic accessories to enhance the wood's exotic feel. This tawny shade is abundant with elegant grain patterns and golden highlights which combine to capture a wonderfully antique look. 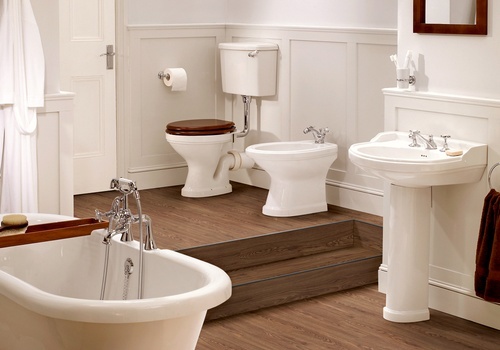 A practical shade for bathrooms, the dark wood makes a lovely contrast with neutral colours and glossy white fittings. 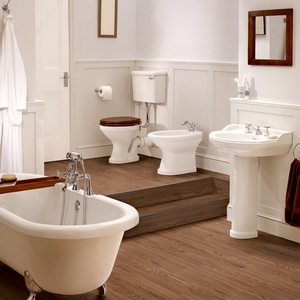 Oozing with creamy mocha shades and smooth grains, Antique Oak is elegantly vintage. 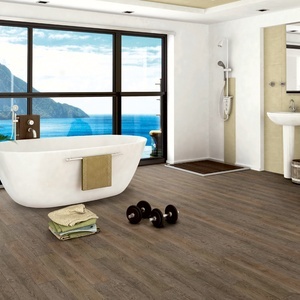 This vintage wood-effect vinyl flooring design brings chocolate shades and flowing grain character into your space. Capturing warmth and elegance at every angle, the floor is traditional in appeal, making a lovely complement for contrasting light furnishing and period décor themes. 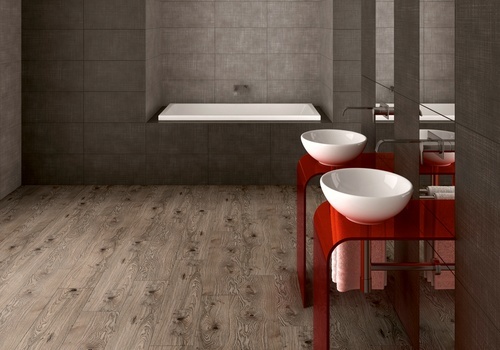 Antique Oak has a scratch and water-resistant surface which also provides superb protection from dirt and bacteria harbouring in the fibres. This means the floor is fit to be enjoyed anywhere in the home, including the most practically demanding kitchens and bathrooms. 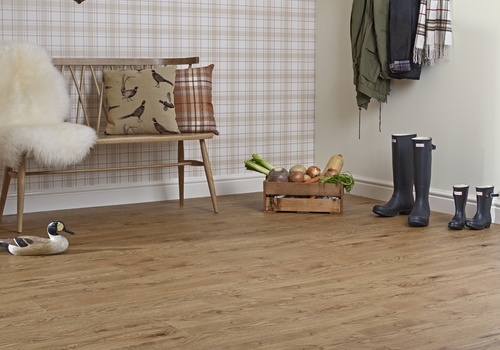 For a closer look at this charming vinyl flooring design, order a free sample or pop in to your nearest stockist to view larger swatches and discuss your design options with an expert. Find your nearest stockist here. Style this elegant wood design with soft creams, pastel pinks and floral touches to capture a wonderful sense of period chic in your space. The wood's bleached tones and bare grain patterns capture an antique feel that's perfect for vintage interiors. 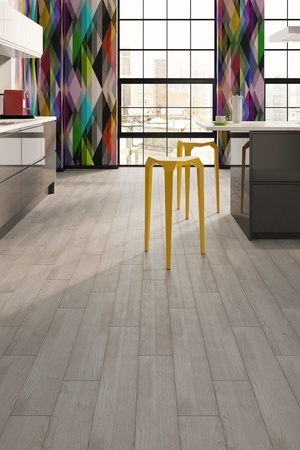 Light blonde shades are defined by lively grains in this bright wood design. 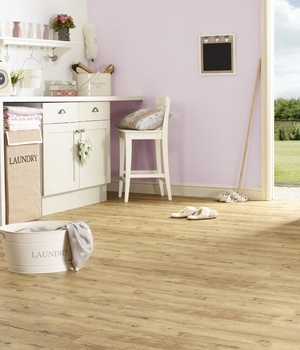 Bleached larch is a light and lively wood-effect vinyl floor design that’s bursting with authentic character. 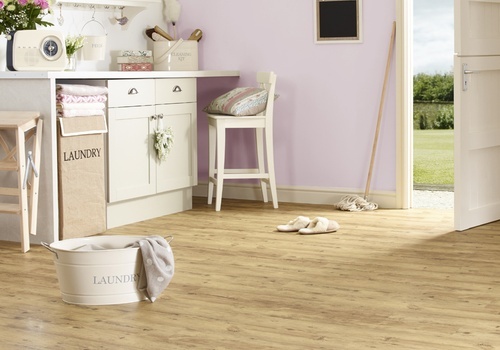 The floor makes perfect company for cute, pastel interiors while its scratch-resistant coating ensures it’s suitable for even the most demanding rooms in the home. Order a free sample of Bleached Larch to get a feel for the floor’s colour and texture or pop in to your nearest Vusta stockist to view larger swatches and get expert advice. Find a stockist here.